In case you missed it on WYLTC last week, I wanted to share the tutorial for my mason jar bathroom shelf. You saw a sneak peek of it when I shared my bathroom makeover. The WYLTC link party is going on now and you have till Friday night to link up anything shelf related. We hope you'll join in! It's Krystal from Sassy Sanctuary here. I hope everyone has had a fantastic summer. Mine has been great but busy... and went by super fast! I'm going to kick off this month's WYLTC and the theme is shelves. I was inspired by all the fabulous mason jar shelves around Blog-land and Etsy. I can't wait to see what every one comes up with! Remember anything goes, whether you build a shelf, finish a craft store shelf or repurpose a shelf, we want to see it! So here is my bathroom mason jar shelf! It turned out being such a fun addition to the bathroom! I love having a place to display soaps and bottles, keep the (always necessary) reading material, and the mason jar for some flowers is the perfect touch. It was a lot of fun and actually a really simple build. It can easily be customized to fit any space and finished to any taste. I love how I was able to finish it to match my bathroom cabinet making it feel like an extension of the cabinetry. 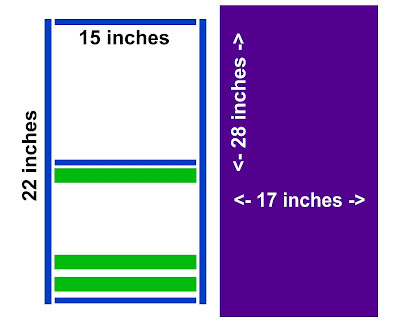 The blue lines are 1x6 boards, the green are 1x2 boards, and the purple backing is 1/4" plywood. The first step is cutting your wood. I had Lowes cut my plywood to the correct width before bringing it home. Then you need to cut your 1x6 into 2 (22 inch) lengths and 3 (15 inch) lengths. Cut the 1x2 into 3 (15 inch) lengths. Next I used my scroll saw to cut a scroll along the top. If you don't have a way to cut this, just leave it square. I made a paper template of the scroll to draw on the design before cutting it. If you plan on having a mason jar in the shelf, you will need to get a circle drill bit the size of your (wide mouth) jar. Drill a hole in one of the 15 inch 1x6 pieces. Then you are ready to assemble the shelf. I used wood glue and a nail gun to put it all together. Note that 2 of the 1x2's is for the slats of the magazine rack, but the other one goes along the back to give a sturdy place to screw through once its time to hang. Don't worry if its not perfect. I had to fill in a bunch of gaps with wood putty, but once it was sanded and painted, it looked great. Then to hang, just drill a couple holes through the back slat and attach with wall anchors. Like I said, its been the perfect addition to my bathroom decor and I love it to bits! You can check out more of the bathroom here, if you'd like. So that's it. I can't wait to see what everyone else comes up with this week! I'm sure we are going to be blown away!